Are you wondering if amano shrimp and bettas live together? It can often be hard to find good tank mates for your betta. If your betta doesn’t attack them, then they may attack him. In this article, you’ll find out everything you need to know about amano shrimps and bettas, and the way you can help them coexist peacefully. 1 Can Amano Shrimp And Bettas Live Together? 2 Why Keep Amanos With Bettas? 8 How Many Amano Shrimp Should You Keep? Before adding amano shrimp to your betta tank, there are a few things you should be aware of. If you don’t take these factors into account, then you could end up with a lot of dead shrimp, or one damaged betta! The most important thing is the temperament of your betta. If your betta has an aggressive temperament then the chances of you being able to add anything to the tank are slim. If you’ve never given your betta a tank mate before then you should avoid amano shrimp as they’re quite expensive. 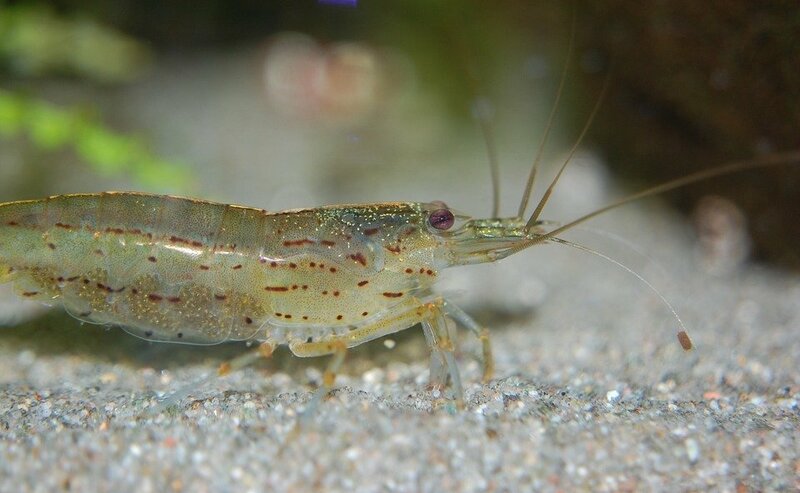 You may be better off adding ghost shrimp which are commonly used as feeder shrimp anyway, or a snail. If you’re not sure here’s a list of the best snails to add. In my opinion, nerite snails are the best to add, especially in a planted tank. Another factor that can reduce the chance of your betta attacking your amano shrimp is their size. When you’re getting amano shrimp from the store, ask the clerk if you can have the biggest shrimp possible. Unfortunately, all fish including bettas may see smaller shrimp as food and not tank mates. As a rule of thumb, if they can fit in his mouth then he’s probably going to eat it. Why Keep Amanos With Bettas? If you’re sure that your betta has a good temperament and the amano shrimp you’re adding to the tank are a good size then you may still be wondering why so many people use them. And there are a couple of great reasons. Because of their small size, they have a tiny bioload. In fact, if you keep a 2-3 shrimp in a 5 gallon tank they’re not going to add any noticeable waste into the tank. This is something that especially important in smaller tanks, where ammonia, nitrites and nitrates can build up especially fast. If you don’t want snails in your tank because you’re scared they’ll eat your plants, then shrimp make great algae eaters. 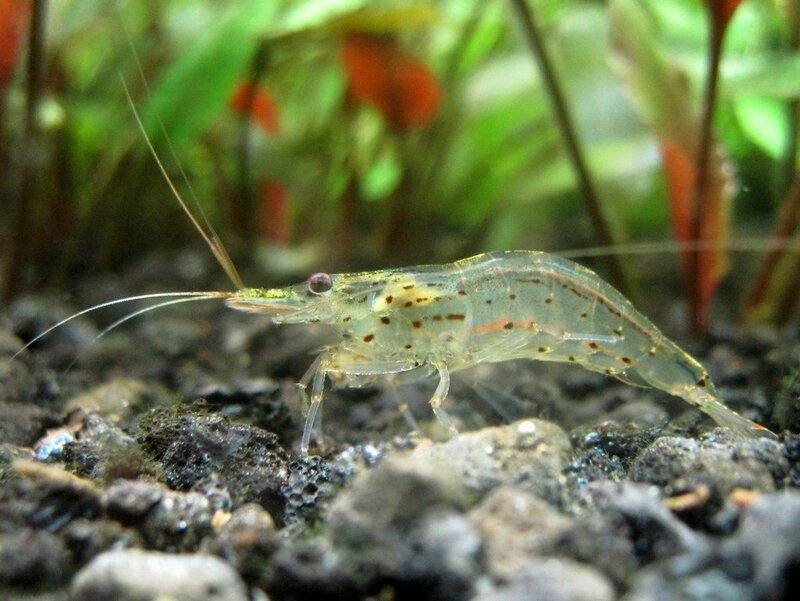 And amano shrimp in particular are known to be the best. In fact, they’re named after Takashi Amano, an aquascaper who used to use them in a lot of his set ups to help remove algae. And of course, if you’re keeping your betta in a nano tank then the amount of tank mates you can keep are limited. If you’ve got a 5 gallon tank then there’s not enough space to add another fish. However, it will be perfect for housing 3-5 amano shrimp and your betta. Amano shrimp are extremely interesting, especially when you keep them in groups. For the most part you can expect your shrimp to be very peaceful with each other and other fish in the tank. In fact, they’re more docile and skittish then they are dominant. The only time you may notice any sort of aggression occur is when you drop some food in the tank. You’ll notice the dominant shrimp getting first bites followed by the rest of them. And as an interesting fact, it’s normally a female amano that is the biggest shrimp as they grow larger than the males. Don’t be surprised if you can’t find your amano shrimp for days at a time. If they’re hiding you can often go days at a time without ever seeing them. This isn’t made easier by their clear coloring. And if they’re not hiding you’ll notice them moving around the tank foraging for food such as algae. And lastly, amano shrimp are always going to be more active when they’re in large groups. Just like in the wild they would be found in large clusters in flowing streams. You should mimic this as much as possible by adding 3-5 into your tank, and possibly more if it’s big enough. Once a month amano shrimp will also molt regularly. Molting is when they outgrow their old shells and begin to grow new ones. At this point they’re going to be particularly vulnerable to other fish in your tank who may try to eat them. If you see your amano molting don’t take the shell out right away. If it’s left in there you’ll notice the all the shrimp eating it because of the nutrients it stores. It can be hard to spot the difference between a dead amano and old skin. So you’re going to have to pay a lot of attention to be sure. However, the old carapace will be extremely clear, clearer than usual. And on top of this, it will normally be on it’s side without moving. Whereas live shrimp will often be moving in some way. After your shrimp has molted, you can expect them to hide for a couple of days until their new shell has fully formed. When you’re housing more than one species together, it’s important that you make sure you’re making the tank welcoming for both. Luckily, in tropical tanks this isn’t hard to do. First of all, you should start by adding lots of plants. Lots of live plants are great, however, if you’re worried about taking care of them then stick to silk plants. You should always avoid plastic plants which can have sharp edges. An abundance of live plants is going to provide all the hiding spots your amano shrimp need to feel safe from predators. And the more safe animals feel, the more likely they are to roam freely around your tank. The best live plants to use are plants such as java moss, as well as hornwort and anacharis. Each of these plants is going to harbor an abundance of small plant debris, algae and bits of food. As well as using live plants you should also try to create other hiding places for them. Driftwood is an excellent choice, and you’ll often notice a large group of them hiding in small hollows underneath the plant. Likewise, if you can find a small cave or shrimp tubes, then you’re setting your tank up to be a perfect home for them. Substrate wise, you don’t really have to worry too much. Just make sure you’re not using overly large pebbles which may end up trapping their legs. On top of this, it will also be hard for them to sift through when they’re looking for food. And lastly, you should avoid adding amano shrimps to a brand new tank. If you do this, then there’s not going to be any algae in the tank for them to eat. So if rather than supplementing their diet with algae wafers, it will be what they live off. When feeding your bettas and amano shrimp they’re going to require completely different food. You should be feeding your betta high nutrient betta pellets as well as live food. And your shrimp are going to need some sort of algae wafer, blanched vegetables, and if you wish, Hikari Shrimp Cuisine. However, one thing you should be aware of is that you’re not overfeeding your shrimp. Technically, they have a job to do in your tank, and that jobs eating as much algae as possible. If they’re not then they’re going to become lazy and always aim for the easiest food source. And on top of that, your tank is going to start looking unkempt once any algae starts to take over. While your shrimp should be getting a high amount of plant matter in their diet, it doesn’t mean they won’t eat meat too. As well as algae and the like, you can also drop in some bloodworms, daphnia, and mosquito larvae for them to tuck into. Frozen and freeze dried are both great choices. When you’re feeding your betta you should only be giving him a pellet or two at a time, but with shrimp it’s a different story. You can choose to chop up their wafers and sprinkle them into their tank, or drop one in whole and let them eat it over time. Both of them have their pros and cons, and in both cases you’ll notice the most dominant shrimp taking their pick first. However, be cautious when you’re adding food to their tank. The last thing you need is to add too much food at once. If they don’t eat it all then it will slowly go rotten. Not only is this going to result in higher ammonia levels, but it could also end up increasing the amount of algae in the tank. And while they love plants such as java moss, you could also try adding some marimo moss balls into your tank. Moss balls are going to pick up loads of food that your shrimp will love. And if you watch them carefully, you’ll notice they’re never actually eating the moss ball itself. And not only is your shrimp going to like your moss balls, but your betta will too! If you add amano shrimp to your tank and keep them healthy and safe for long enough, then they’re going to survive for 2-3 years. In this time, it’s more than likely that they’ll grow up to 2 inches in size! You should be aware that while amano shrimp are easy to care for. When you first introduce them to the tank it’s more likely that they’ll die. This is due to them being shipped around as well as trying to adapt to any water changes. However, once they’ve adapted they’re very hardy and should live for a long time. How Many Amano Shrimp Should You Keep? As a rule of thumb you should keep 1 shrimp per 2 gallons of water. However, in the case of a 5 gallon tank you should start with 3. But because of their large size, you still need to be careful when considering how many shrimp to add to your tank. Once you have about 6 shrimp in a tank (if it’s big enough) that’s when you’re going to reduce the chance of dominant behavior occurring in them. And don’t worry about their bioload. Because it’s so small you’re barely going to notice it in your tank. Caring for amano shrimps is particularly easy. The most important thing is to make sure you never add copper into your tank. While it’s important for them to survive in trace amounts. A large dose is going to be poison to them, and any other invertebrate that’s in your tank. As well as avoiding copper you should also make sure that the temperature and pH levels in the tank don’t swing dramatically. And of course, you should make sure they have a safe hiding place for when they molt. And lastly, when putting amano shrimp and bettas together you should make sure the tank conditions are going to be hospitable for both of them. As you know a bettas ideal temperature is 78°F, however anything between 76-82°F is fine. Luckily, an amano shrimp can survive in temperatures between 70-80°F. So if you can hit the 78°F sweet spot, they’re both going to thrive. And secondly bettas need a pH as close to neutral (7) as possible. Amano shrimp on the other hand like a pH that’s between 6-7. The good news is that bettas can also survive in slightly acidic conditions. So even if the water falls a little below a pH level of 7, it’s still going to be fine for both of them! So to recap, keeping amano shrimp and bettas together is an excellent choice! Your bettas temperament and the size of your amanos are going to play a large role in whether they’ll survive or not. Amanos are fantastic algae eaters and great for small tanks. Amano shrimp are docile and often hide for days without being seen. They’re also best off in groups of 3 or more. You may think your amano shrimp is dead, when in fact it’s molting. An easy way to tell is if it’s bright orange. If it is then they’re dead. The ideal habitat for amano shrimps and bettas is one that is heavily planted and with a lot of hiding places. You can use any substrate as long as it isn’t too big. You should feed your betta a mix of betta pellets and live food and supplement your shrimp with algae wafers, blanched vegetable and Hikari shrimp food. They’ll also eat meat and algae in your tank. Amano shrimp will grow up to 2 inches in length and live for 2-3 years. You should keep 1 shrimp per 2 gallons of water and either keep them alone or in a minimum group of 3. Make sure you never add large amounts of copper to your tank and that the pH levels and temperature doesn’t change dramatically. If you do all of this your betta and amano shrimps will live long lives! If you have any more questions leave them below. Otherwise be sure to check out the rest of the website!